Upwork is a global freelancing platform, where freelancers get to interact with clients around the world. Upwork creates a platform for people who seek professional, to get help from credible freelancers. Upwork is one of the most highly sought after freelancer platforms we have today. Despite its global acceptance, there are still some people who seek alternatives to Upwork for different reasons. In this article, we explore a comprehensive list of the best alternatives to Upwork. Hubstaff is a free platform for freelancers. It helps freelancers connect with clients for free. It displays the hourly rate, skills, experience, availability, résumé, and languages spoken by the freelancers. Freelancers are allowed to add a short description, helping them clearly describe their skills. Similar to other freelancer platforms, clients simply have to browse the profiles of freelancers on Hubstaff, searching for the desired freelancer. It’s a free directory for companies looking for remote talent across the globe. There are no markups and no fees on either side (freelancer or business owner). That means freelancers get exactly what their client pays them. Because there are no fees, Hubstaff Talent takes a very small role in the pairing and agreements client and talent work out. There are no fees levied on projects or hourly work. Employers are free to reach out to freelancers, interview them and hire them at no charge. To complement the free directory, Hubstaff’s project management software, Hubstaff Tasks can be used for an additional monthly fee. Credo is a freelancer platform, made specifically for freelancers who are into Freelancers. Unlike other freelancer platforms, the credo is streamlined to only freelancers who are into services, you are assured of getting freelancers, who have high integrity, and are truthful about their capabilities featured in their portfolios. Services offered by freelancers on Credo includes the following. The Credo process is more like a concierge service that guides you throughout your project. They vet every agency and consultant in their network. The Credo team gets on the phone with you to make the right recommendations and introductions in under 24 hours. Credo reaches out to potential agencies and freelancers who are the best fit. When they accept, you are introduced. Credo helps with project proposal reviews and clarifications and then checks in from time to time to ensure the project is moving along well. Fiverr is unarguably one of the most popular freelancer platforms we have today. Scrolling through the Fiverr platform, you going to find a long list of digital services, hitting the pillars of the most sought after digital services. On Fiverr, you are going to find just about any service, for as low as $5. Being a very popular Freelancer platform, you should be aware that freelancers don’t make much here, the competition here is very high. You have the option to post a project or browse through gig offers to find something that fits your requirements. Fiverr is best used for specific gigs with predetermined outcomes. High rated sellers and Pro-level providers charge way more than just $5. Expect to get what you pay for. Creating an account is free and you can communicate with the freelancer prior to placing an order with them to ensure outcomes will be delivered in the manner and time frame you need. Fiverr is better suited for people who want a gig completed quickly and within a small budget. Like we mentioned above, Fiverr covers a wide range of services and is less focused than other platforms. As its name clearly indicates, Freelancer.com is a website designed for interaction between clients and freelancers. It is a very simple site. Freelancers create portfolios, portfolios are seen by clients, who then decide if they like your work. Freelancer.com has over 17 million users with over 9 million projects. The freelancer.com platform, is very intuitive, signing up the process for employers and small business is as simple. In search of a freelancer on this platform, all need to do, is fill out your project details, select skills you want, select pricing options and project files for applications persure. Still, on the topic of best alternatives for Upwork, outsourcely is yet another awesome alternative, you should look out for. Outsourcely was born out of the limitation and cost of using platforms like Odesk, Elance, and lots more. it is a very reliable platform, for finding credible freelancers. The talent on Outsourcely is by and large looking for long-term remote work opportunities. 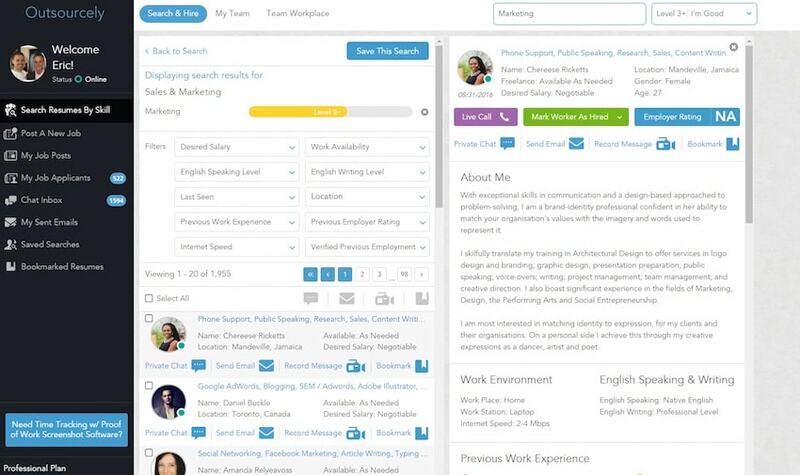 Outsourcely allows employers to interview and hire talent directly without any involvement from Outsourcely. Employers can pay talent directly without extra fees being levied. Prospective employers can interview and hire talent with real-time communication tools built into the platform, including real-time private chat, browser-to-browser video and voice calling, video and voice messaging, or direct email. This makes the hiring process much quicker and easier. Like Upwork, you can find a freelancer through a skills search or by posting a remote job. Employers have the option of managing their remote team via the Outsourcely Team Workplace platform, or even inviting their existing staff to Outsourcely in order to use a single management tool. Similar to Credo, Textbroker is streamlined to freelance writers, that you can hire to write articles for your blog. Textbroker is one the most highly sought after alternatives to Upwork, for those in search of good content writers. How does Textbroker compare as an alternative to Upwork? Here are a few differences. This site focuses purely on freelance writing services. You create an account and get to select your order type, quality level and set up instructions. You get access to 1000’s of writers from all over the world at different skill levels, as per their star rating. You can then deposit funds to place the order. You get to decide who writes the article and delivery dates. Alternatively, you can use the managed service option which starts at $2500, where a team handles the entire process for you. Textbroker’s API makes integration with your CRM or CMS easy. No commissions are paid. Just a monthly plan fee that is as low as $19 per month. Can find freelancers who work in your local area for full-time, part-time or contract roles. A matching algorithm provides a curated list of potential candidates, as opposed to having people apply or having to hunt them down. You save time by contacting candidates directly and immediately. You get to negotiate terms with the candidate, saving time and money. There you have it – a comprehensive list of best alternatives to Upwork. If you have other recommendations or personal favorites, feel free to drop them in the comment section below.